I don’t know how cold it is where you live, but where I live it is 20 degrees below normal for this time of the year, meaning it’s dropping into the single digits for tonight. Which also means I’m thinking what on earth I can feed people at my big launch party Friday night to warm not only their souls, but their bodies. 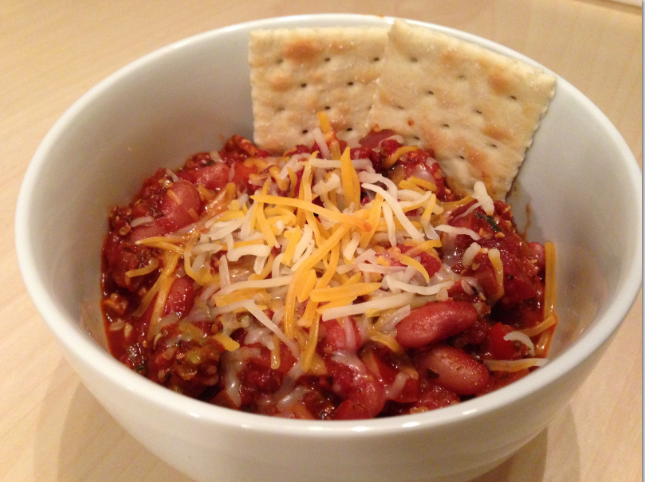 Perhaps the coziest recipe out of the 51 included in Blue Moon Vegetarian is Spicy Bean Chili. It not only will warm you from the inside out, but it also will give you a nice protein boost, since it is dosed with hemp seed. Plus, it’s one of those warm-you-twice things, since it takes a few hours to cook red beans, and if you’re lucky enough to own a gas cooking range, you know what I’m talking about. It also gives you an excuse to put your feet up for a while, under a nice cozy afghan with a cup of tea. Combine beans and 2 quarts of the water in a large soup pot. Bring to a boil. Remove from heat and allow to cool. Drain. Return to pot and add the last 2 quarts of water. Bring to boil. Lower heat and cook uncovered until beans are soft, approximately 2 hours, then set aside. In a separate skillet, sauté onion, garlic, and bell pepper in oil until just starting to soften. Stir in spices, herbs, agave syrup, and chocolate, but not hemp seed. Add mixture to beans along with tomatoes and tomato sauce, using vegetable broth to thin as necessary. Allow to simmer for 30 minutes or so, then sample. Adjust spice and seasoning to taste. Add hemp seed. Do not allow to boil. Simmer on low another 30 minutes. Allow to rest and cool before serving. Top with a bit of shredded cheddar and plain yogurt. Goes great with a handful of organic saltines or crushed tortilla chips.